On Thursday morning, Global Leaders were very excited to visit the Crenshaw/LAX Transit Corridor Project. At the time of bidding, it was the project with the largest contract in Walsh history, but was overtaken by the Redevelopment of LaGuardia Airport’s Central Terminal B project in 2015. During a “best value competition” a Walsh Construction and J.F. Shea Construction joint venture along with their designer HNTB Corporation submitted the lowest bid of $1.27 Billion as a part of Design-Build delivery method and the venture was later awarded the contract. 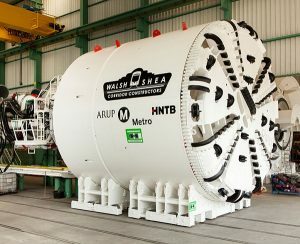 Comstock National Transit Inc., ARUP and the LA Urban League have also been involved in the Crenshaw project under the leadership of Walsh. By adding the land acquisition cost, the project will have a total price tag of $2.058 Billion. We were introduced to the project by our Walsh contact, Mr. Josh Shubin. Back in September 2013, Los Angeles County Metropolitan Transportation Board of Director provided the construction team with a notice to proceed while actual construction activities began in the spring of 2014. As for the estimated completion date, it is set to take place on October 21, 2019 with 24-hour 6-day shifts. The objective of the project is to provide underserved areas of Los Angles with new public transportation options and represents a one step closer to getting Los Angeles International Airport (LAX) served by light rail transposition system. 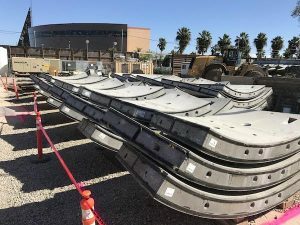 The 8.5-mile-long light rail transit system will require the addition of eight stations: three of which will be located underground, four will be at grade level, and one will take place above ground. The Walsh/Shea project will also be responsible for constructing a maintenance facility, six aerial bridges, park and ride lots, and traction power substations. After that, we were all given a safety orientation by RW Carpenter (safety manager) and a detailed explanation regarding cases of emergency. As a result of the project cutting through various residential and commercial areas, staging and parking was a key issue that the construction team had to solve. To mitigate the impact of the problem, Walsh/Shea decided to lease temporary parking and offer residents and customers of affected areas the opportunity to use them. To make amends with the local community, the project team set a goal of hiring as many people as possible within a fifteen-mile radius of the site. 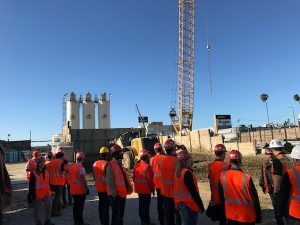 We were supposed to visit the aerial station, however, things quickly changed when the construction team gave us the green to get a closer look at the Tunnel Boring Machine (TDM), Harriet, named in honor of African-American abolitionist Harriet Tubman. The machine requires a staff of 22 per shift to be fully operational. Fun fact: Harriet has her own Twitter account (@crenshawtbm) where she constantly shares status updates and often like to send motivational Tweets to fellow TBM’s. Global Leaders made their way to the below grade section of the project with Josh and RW leading the way. Unfortunately, before jumping on a train to observe a tunnel that’s currently under construction, we were asked to store our mobile phones in a secure location. Therefore, we were not able to take pictures while the tunnel. While we were between 60 and 100 feet deep below ground level depending on the condition of the earth above, the train that moved us around from station to station was running on a temporary rail system which currently serves both as a people carrier and as a device to move excavated earth to at grade locations. 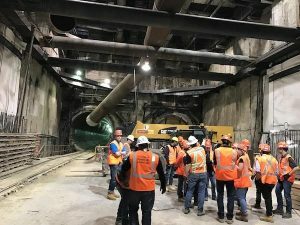 Components we often take for granted in many construction sites like air and water propose logistical challenges that the team needs to tackle in such project as the Transit Corridor Project. Also, we noticed the massive air ducts that supply fresh air to the site along with an intricate water pipes system. Many hydraulic power units that transform electric power into hydraulic power to push the TBM were also visible. Hitting a gas pocket is always a potential risk in this type of projects and the installation of monitors to record the level of Methane and Carbon Dioxide are a way to mitigate the problem. 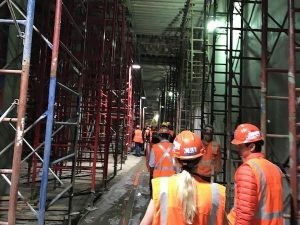 The Global Leaders got to see an adjacent finished tunnel with its concrete precast panels in place and concluded the tour by discussing the details of the train stations construction including their finishes and their structural support system. 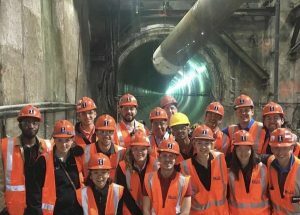 With the tunneling portion of the project almost over, we were all grateful to witness and learn about running a complex project.